I made my branch ladder for a May flower display on my entry porch but as I finished it, I knew that the ladder was a framework for many seasons. I have ideas for changes as the year passes. But a little searching showed me this is not a unique idea. Let me share some of my discoveries. The most represented season is Christmas because there is a clear similarity of shape between a Christmas tree and a ladder. 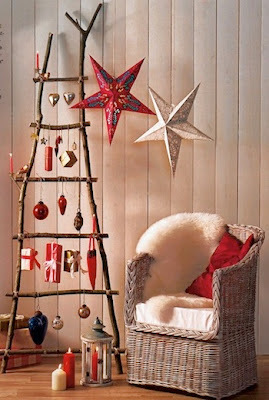 The first one has a decidedly Scandinavian feel because of the red, white and wood. 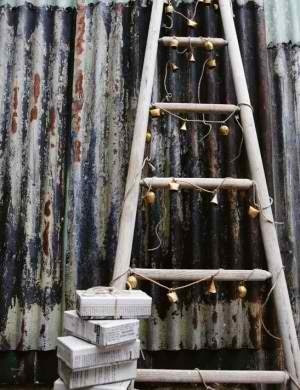 Here are an series of ladders decorated for the Christmas holidays. 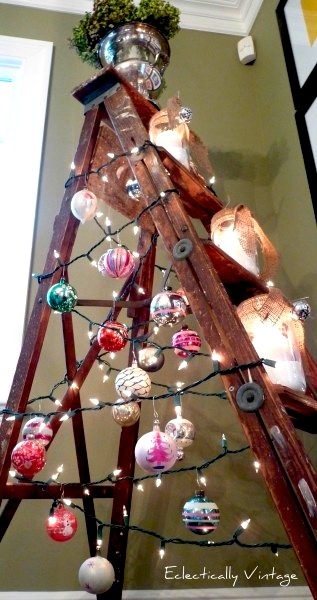 Some might give you an inspiration for a different approach to the traditional tree. 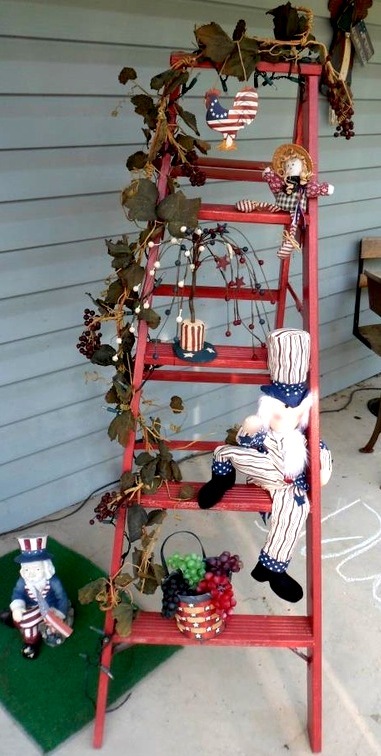 And I found one 4th of July festooned ladder as well! 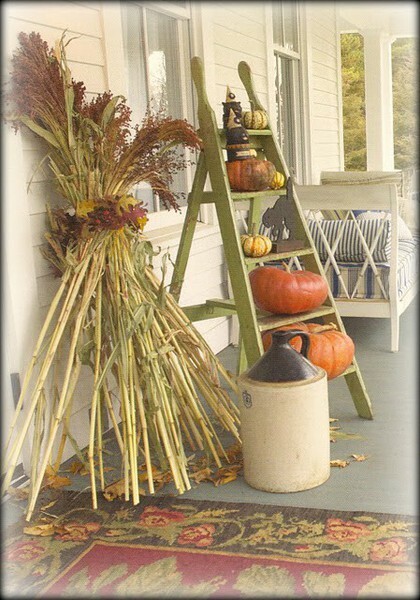 It is easy to go overboard with a theme. 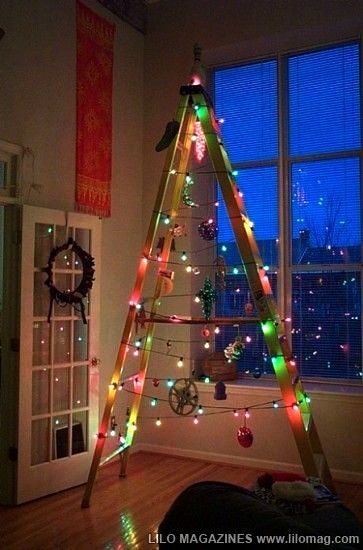 But I look forward to trying out new ideas with my ladder. Update 5/20/12 Just found another 4th of July ladder! Ladders and Shoes! Of Course! 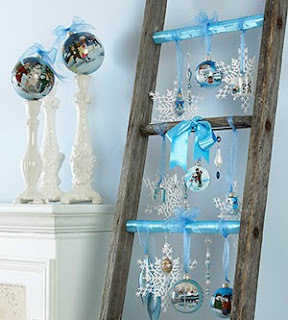 I've had a great time checking every day to see what new ladder-mania you've found! I now have so much inspiration. Thanks! This was fun. And I keep finding more! 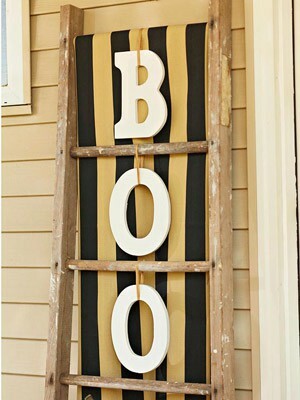 Check out my overview post with all the ladder posts organized for easy future reference here. I did a similar series on branches here. Thanks for visiting and commenting Deb! Most of these are very clever and I am sharing withy wife. I need to point out that the last one is an inappropriate use of an American flag and a high quality sewn one at that. If it was bunting that would be different but the flag should not be used as a craft project. This one has been stained, twisted and tied to a ladder?